The sculpture will be 12 inches tall and will be cold cast in resin bronze. There will also be a real bronze version which will be limited to 10 casts only. I have researched and carefully crafted each and every component in 3D. 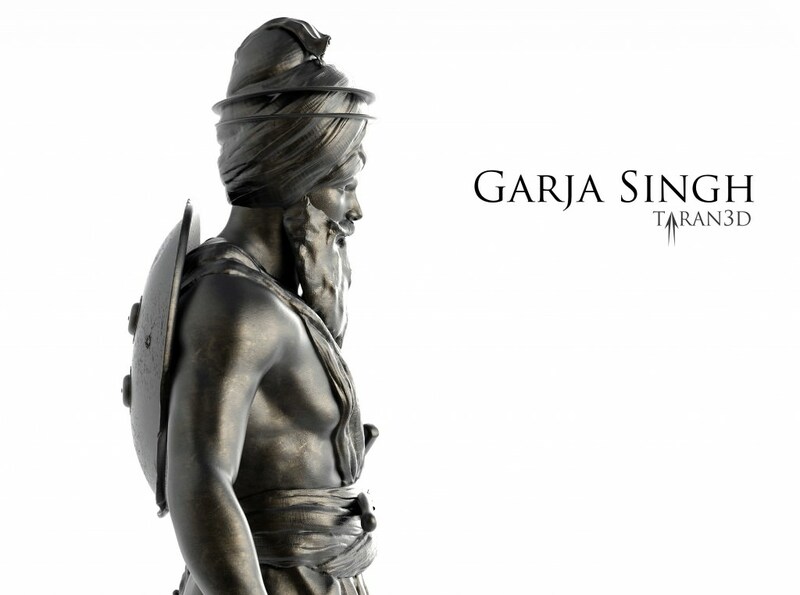 The images below show my reference source material used to recreate Garja Singh. 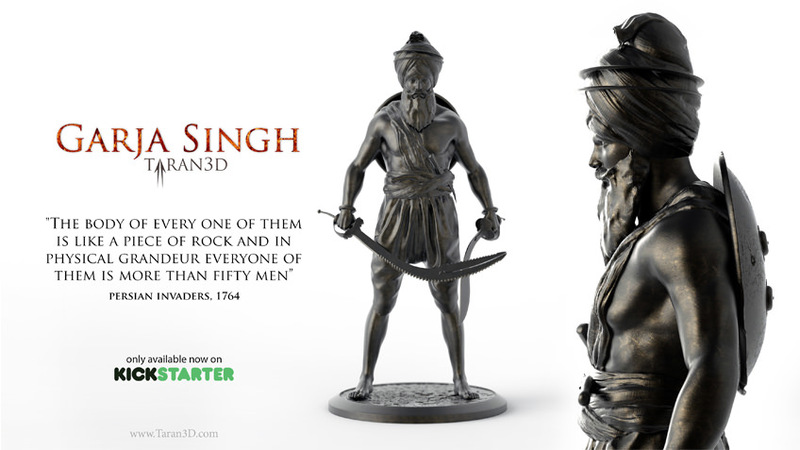 Sikh history and art are my passion and I have always been inspired by stories about the brave Sikh warriors who who rose to forge their own Sikh empire in Punjab during the 1700’s. I wanted to create something that would remind people of their bravery and celebrate their inspiration sacrifice. This is my way of sharing their story with the next generation. The three quotes below are written by Qazi Nur Mohammed, a persian war chronicler who accompanied Ahmed Shah Durrani during his invasion of India in 1764. During the invasion he wrote about their encounters with the Sikhs. This character takes inspiration from the story of the martyrs Bota Singh & Garja Singh who were legends who awoke the punjab with their audacious acts of defiance. In 1739, Zaikriya Khan, the Mughal governor of Lahore launched an all out campaign of persecution of the Sikhs. Rewards were offered for the capture and extermination of Sikhs. It was declared lawful to plunder Sikh houses and to seize their property. Thousands of Sikh families were murdered. Cartloads of their heads were taken to Lahore for obtaining rewards from Zakariya. When Bota and Garja Singh were passing a mughal checkpoint they heard mughal soldiers mocking the Sikhs saying that the government had wiped them out and they now hide in the jungles like dogs. Bhai Bota Singh and Garja Singh were deeply offended and decided to teach them a lesson. They took over the checkpoint and sent a letter to Zakiriya Khan that they would now be charging a Khalsa tax from anyone who wants to cross as they, the Khalsa army of two, are the true sovereign kings of Punjab. News of the letter passed far and wide and the people were amazed by the brave act of defiance they had displayed. This embarrassed the Mughal Governer and he immediately dispatched a battalion of Mughal guards to deal with them. The battalion sent forward 10 guards who were dispatched swiftly by the two Singhs. Fearing death the battalion charged forward and the brave Singhs died fighting in battle. The whole of Punjab heard of their sheer grit and determination and they knew that the Sardar Khalsa were still alive and would rule this land one day. Within 60 years the Sikhs forged the first secular Sikh Kingdom where people of all backgrounds and religions could prosper in peace. I hope you like the sculpt and support this project. I would like to say a special thank you to Kam Singh Samra, Harjinder (Infamous Arts) and Daljeet Singh, author of Project Life. Vaheguru Ji Ka Khalsa Vaheguru ji Ki Fateh ! Could you please tell me the price and where I could buy one from?